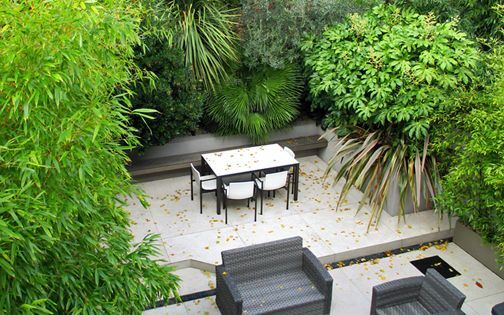 We often design with ethnic influences, and this Hampstead garden features a lush Island of Bali ambience, where sheer simplicity and clean-lined surfaces elevate layered, subtropical foliage, enhancing indoor-outdoor fluidity. 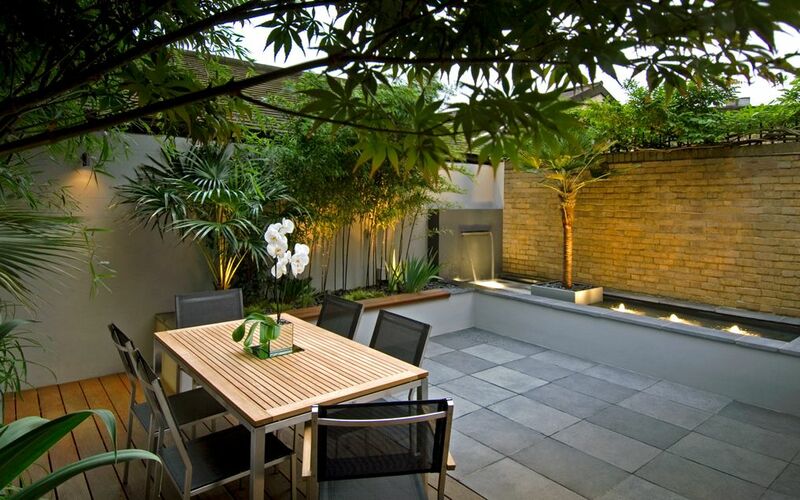 Grey limestone paving emulates the kitchen's floor pattern and colour gamut, while the scale of a perimeter brick wall is echoed with an Ipe hardwood dining zone, forming a scheme which reflects our clients' modernised home and its warm nuances. 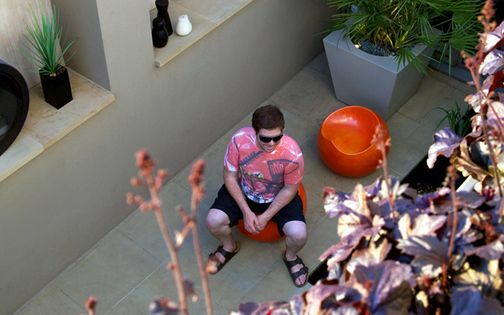 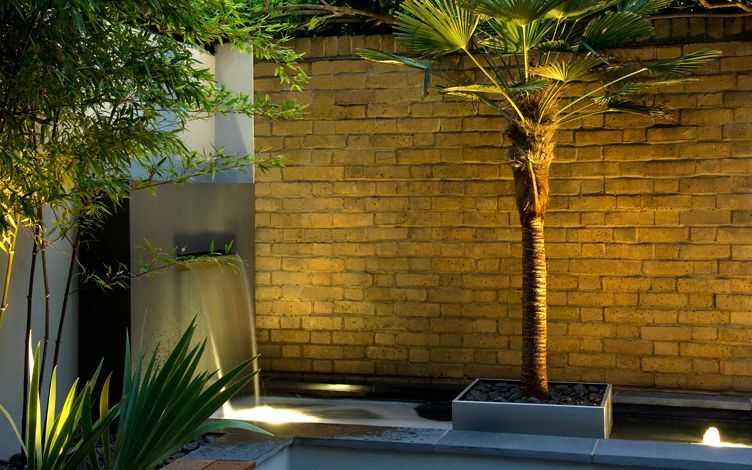 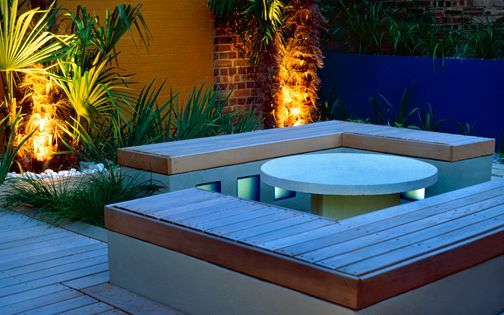 When we met in early spring, the clients had just returned from a holiday in Bali, seeking a garden design company to transform their outdoor space with an innovative, fresh approach. 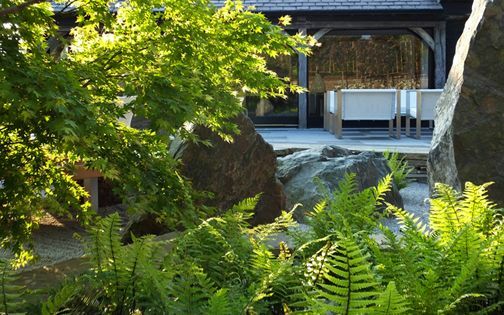 The design cue was taken directly from this travel experience, while the home's myriad of wood artefacts inspired an organic interplay between a cosy interior and the backdrop of a natural yet chic garden sanctuary. 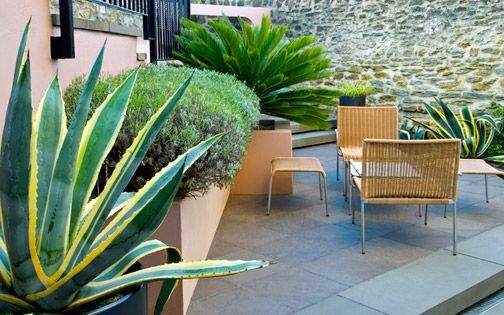 We included an abundance of exotic vegetation to create an intimate, secluded haven in the warmth of this southwest-facing courtyard garden. 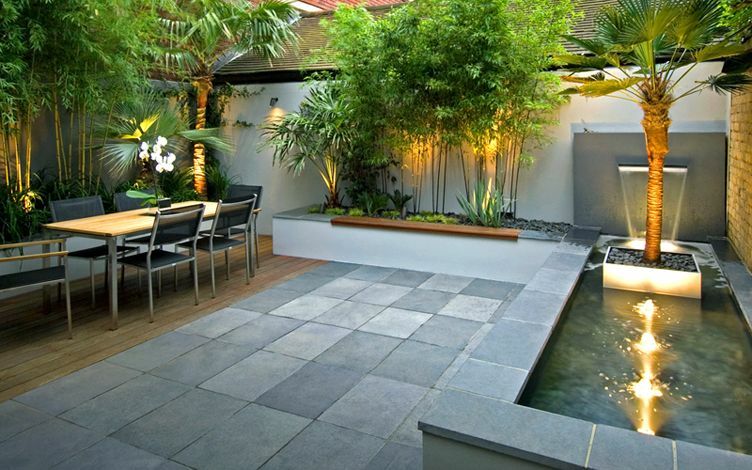 Rectangular grey limestone pavers continue the kitchen's surface pattern, complementing the interior's colour palette and textures. 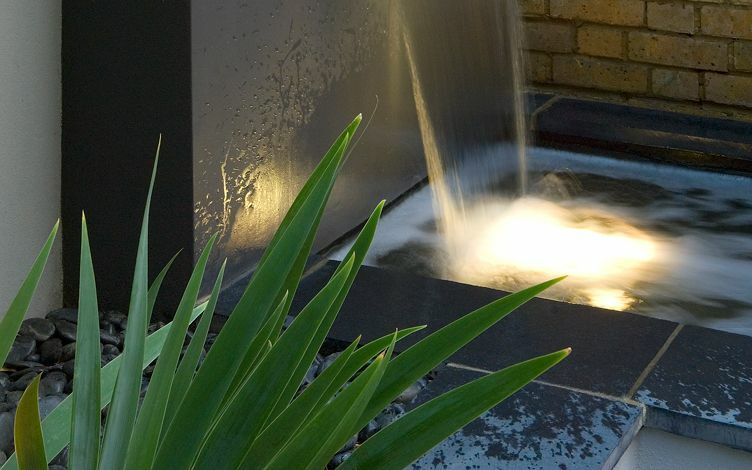 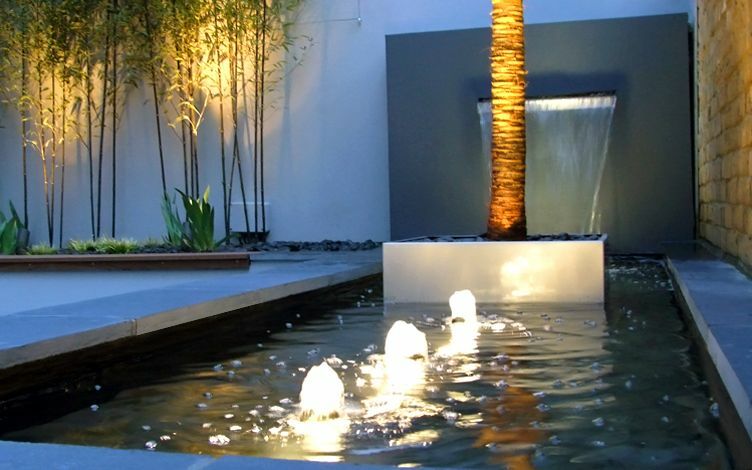 With the space balanced, appearing twice as big as before, the pool was fine-tuned, and although this water feature design evolved as a functional, white noise element, it forms a distinctive garden space. 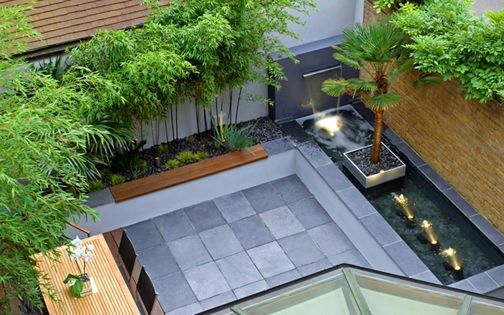 Appearing as a discrete zone, amid its own serene ambience, the pool reflects energising silhouettes, where a Palm tree appears afloat in a watertight vessel, situated near the waterfall's chute – anchoring a compelling, triangular composition of tall sculptural Palm trees. 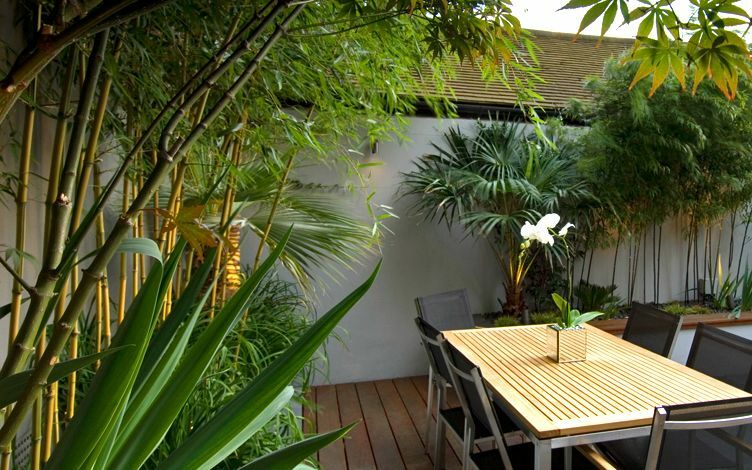 We continually travel to nurseries to select plants, where we develop new architectural designs for ongoing projects. 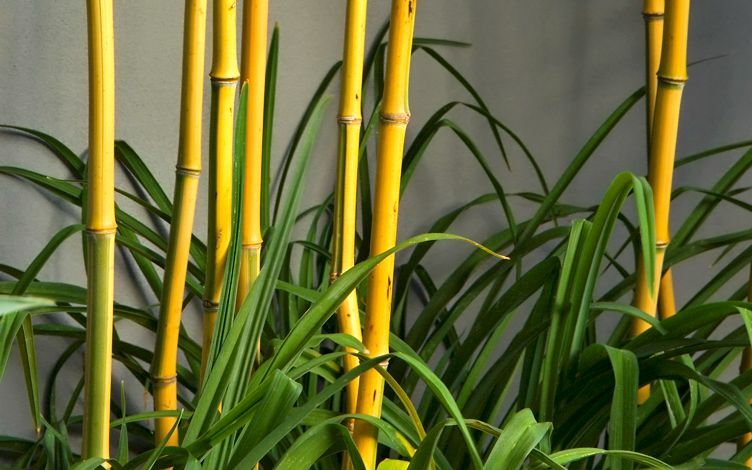 Here, there was scope to further this study, particularly in Palm species. 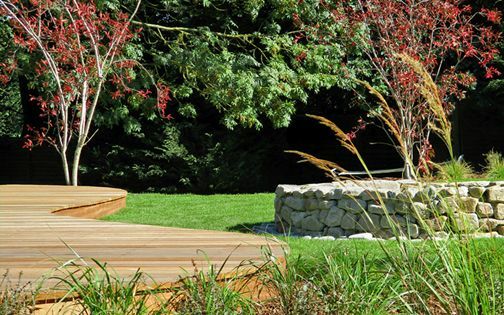 The specimens were collected from three specialised nurseries – their trunks cleaned and canopies thinned, while ramps were built throughout the garden to enable lifting the heavy trees into raised beds. 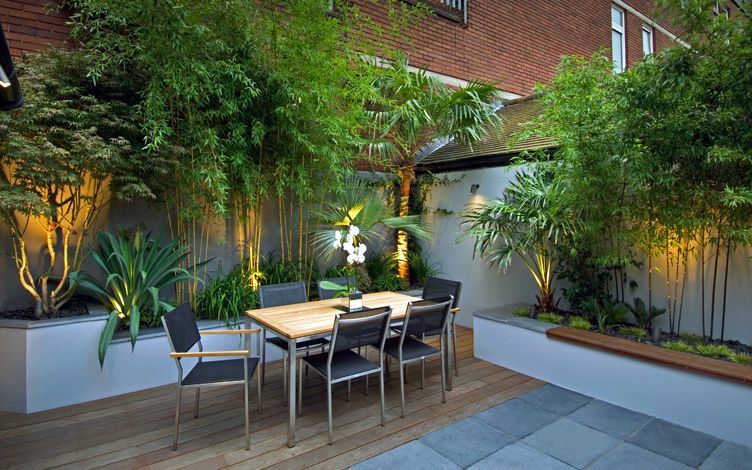 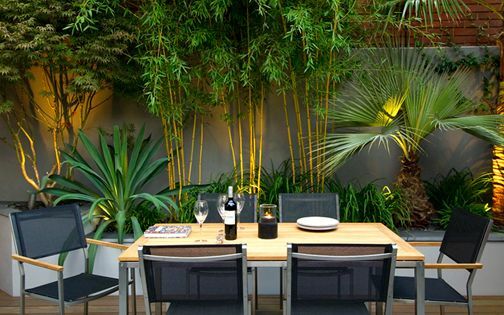 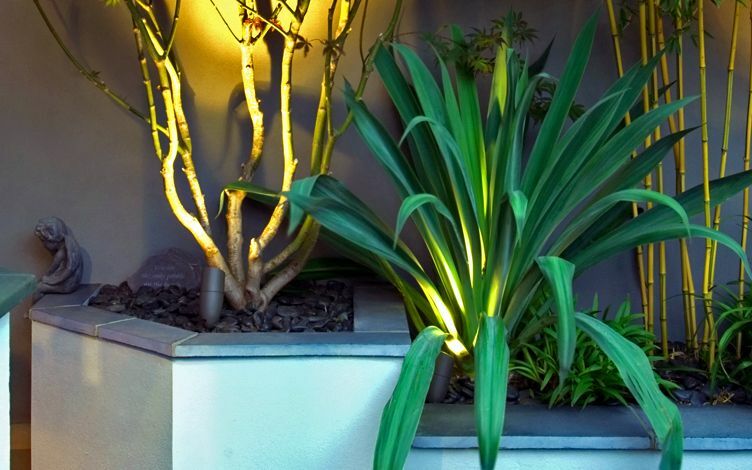 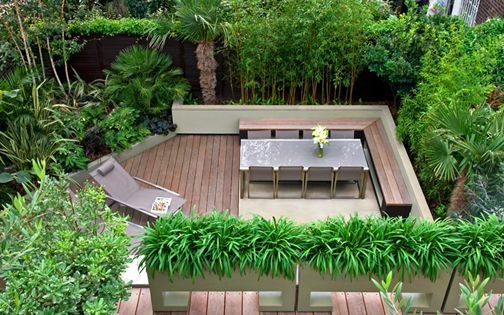 The planting design includes flora from Australia, China, Japan, Mexico and South Africa, and we consistently embrace such a cosmopolitan foliage array when redesigning a sheltered, lush London garden to amplify its eclectic urban essence with diverse leafiness around cosy dining areas. 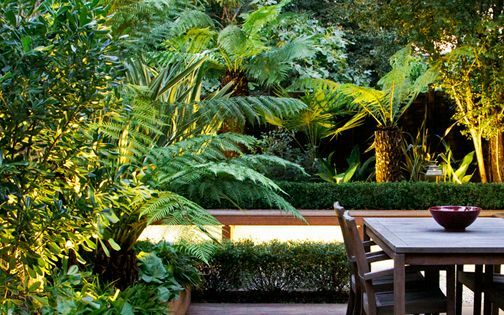 A London microclimate is optimal for cultivating semi-hardy plants, and in this south-westerly courtyard aspect, subtropical flora thrives to portray a tropical garden design. 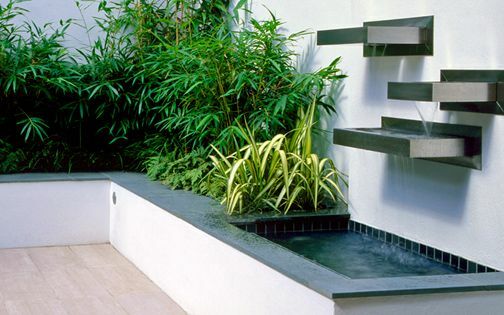 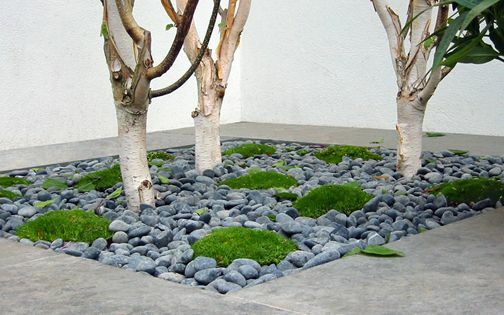 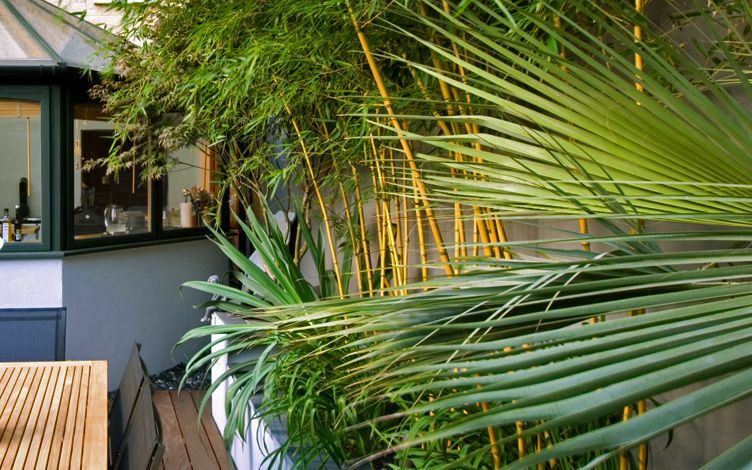 A modern, streamlined approach within the hard landscaping contrasts luxuriant, jungle-like foliage, and includes four unique Palm species, Bamboos, Japanese maples, Mexican lilies and Jasmine climbers. 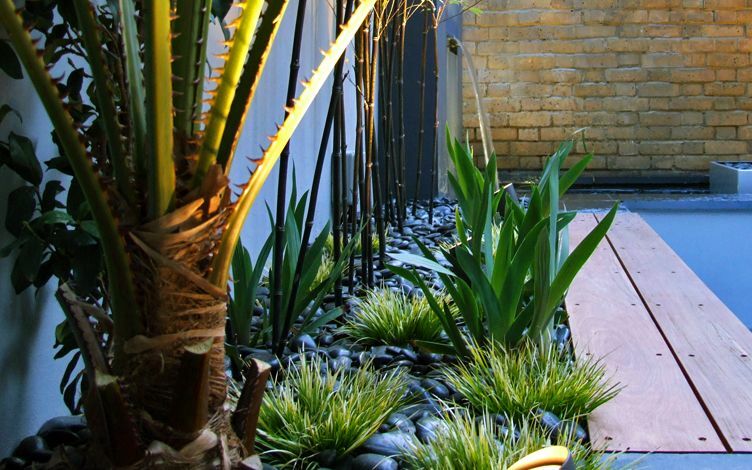 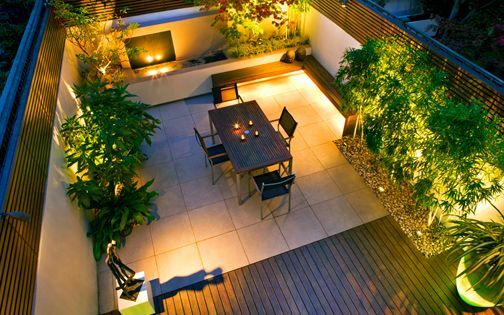 Our clients sought a natural design integrity, fused into an intimate private courtyard, and their renewed garden produces a dynamic layout within a highly textural scheme, enhanced by architectural silhouettes, as lighting at dusk transforms this courtyard into an opulent, modern town garden.